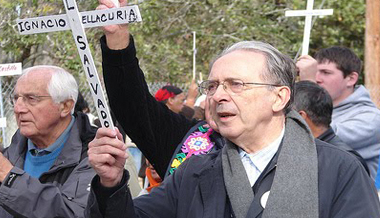 Spanish-born Jon Sobrino is a Jesuit theologian known for his work in liberation theology. He escaped assassination in El Salvador when members of the military broke into the rectory at the University of Central America (which he helped found) and brutally murdered his six fellow Jesuits, their housekeeper, and her 15-year old daughter. Sobrino was traveling abroad at the time. We have learned that the world’s poor are practically of no consequence to anyone—not to the people who live in abundance nor to the people who have any kind of power. The First World is not interested in the Third World. As history shows, it is interested only in ways to despoil the Third World in order to increase its own abundance. In 2007, Sobrino was the subject of a theological critique and an admonishment by the Congregation for the Doctrine of the Faith. This move was interpreted by many as part of the ongoing attempt to halt the spread of liberation theology. Jon Sobrino on liberation and salvation. Jon Sobrino on the needed actions of the "privileged."